When Sifu Bogdan Ruso asked me to review his new Wing Chun course, How to Make Your Wing Chun Kicks Invisible, and tell you about it, I didn't know what to expect. I was a little put off by the name because it has one of those loud, bold titles that just sound a little unbelievable. But, this course can benefit you if your kicks and footwork are weak. It provides plenty of tips, drills, techniques, and background information to help get your leg strikes and footwork up a notch or two. It has 17 separate video lectures with over two hours of material. These are not boring lectures. Most of them are how-to demonstration videos, which you'll get more out of by doing (not by sitting and watching). When I first read the table of contents, many of the lecture titles didn't sound like they had much to do directly with kicking. So if you're looking for a course that's purely focused on kicking alone, you may be disappointed. However, it's worth repeating that his course is not full of fluff. Sifu Bogdan doesn't assume you're highly skilled at Wing Chun. He spends a good amount of time setting you up with a good foundation and helping you understand how the legs (kicking and footwork) and the hands work together in a real fight. Because of this I'd say this program is very good for beginner and intermediate practitioners, as well as non-Wing Chun martial artists who want a good overview on Wing Chun kicking. Advanced practitioners could still get good use out of this, especially if they've picked up some bad habits or don't spend enough time on kicking (which happens a lot at many kwoons). What Else Will You Get From This Course? This is a online course hosted on the Udemy platform. If you're not familiar with Udemy (think university/academy) it's an online platform where you can learn all kinds of things through streaming online video. If you have an unstable Internet connection, you may have some hiccups with your lectures. One solution you're probably familiar with is to simply step away for a cup of tea and let the video load. Then when you sit down again, it should play smoothly. 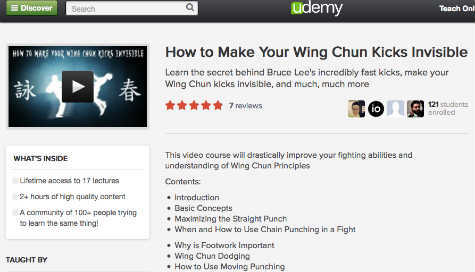 The Udemy platform is very intuitive and easy to navigate. I like that it keeps your place. So if you don't have a chance to watch the whole course in one sitting (like I didn't) you can pick up where you left off. And if you're into Gamify-type electronic learning (that's where learning software keeps score like a simple game), Udemy keeps track of how much you've completed with notices (i.e. You've finished 53% of the course). This is nice because it can keep you moving forward. The course quality is excellent. The sound, video, and production value is clean and professional. Great for newer and intermediate Wing Chun practitioners.